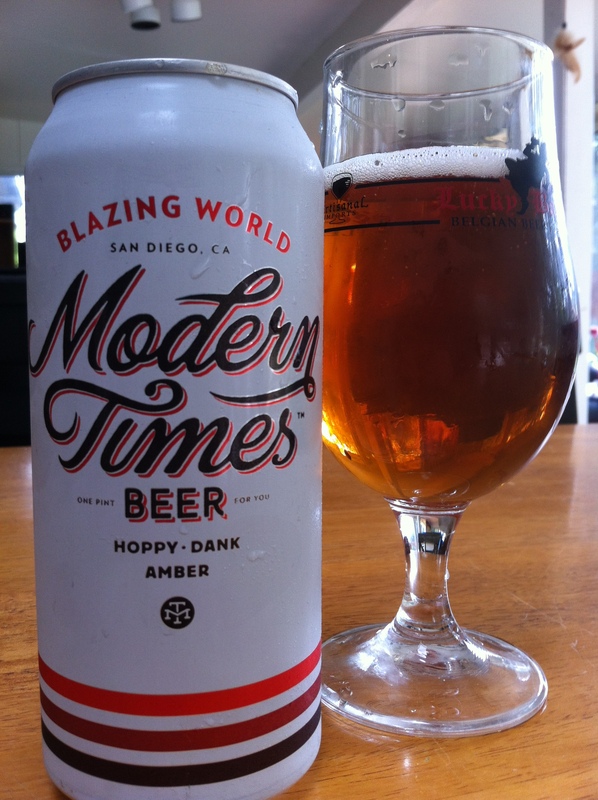 Modern Times has recently blazed on to the craft beer scene. And before you ask, yes, I hate myself as much as you hate me for that horrendous turn of phrase. Buzz about the quality of their products had been growing exponentially online, but it wasn’t until a few months ago that their beers actually started showing up in my neck of the woods (Los Angeles). Factor in my growing love for canned beers and I knew I had to pick up a four-pack as soon as I saw it. This wasn’t the first Modern Times beer I’d had, but this one will get the first review. BLAZING WORLD is a hoppy Amber Ale with 85 IBUs and a 6.8% ABV. This beer is the stickiest of the icky. It’s a luxuriously hoppy amber loaded up with intemperate quantities of Nelson, Mosaic, and Simcoe hops, which are some of the fruitiest, dankest hops sweet, sweet money can buy. Despite its amber hue, Blazing World is pleasingly dry, sporting a lightly bready malt backbone that serves as platform for the huge & complex hop profile. With a nice little pop and hiss I excitedly poured the beer from its tallboy can into my tulip glass. There’s something very enticing about the beautiful amber color from an Amber Ale. Just look at that picture. Mmmm. Copper highlights popped up when held to the light. Head is nothing more than a white ring around the edge with some film in the middle. Sheets of bubbles rise up along the side of the glass with each swirl, but they don’t stick around for long. The nose is big on hops. Let me repeat that. The nose is BIG on hops. Are they sure this is an Amber Ale and not a West Coast DIPA?? Pine resin and cedar are dominant, with some sweet tangerine and orange marmalade notes to even things out a bit. In all honesty if I didn’t know better I would have guessed that this was an IPA and a good smelling one at that. Taste heads right back down the same path that the nose first blazed (I’m done, seriously, I swear I’m done). Pine resin and orange marmalade walk hand-in-hand down your gullet with the first sip. There’s faint hay and grass notes toward the end of each drink, before finishing with hints of tobacco and tea. This beer gave me a mental image of squeezing full cone hops directly into my waiting mouth. Very juicy and delicious. What style is this again? Mouthfeel is light-to-medium and oh so creamy. I would have guessed that oats were used in this beer, but it wasn’t listed on the ingredients list on the back of the can. There is a bitter hop bite, but it’s juicy enough to keep the beer from being too dry. 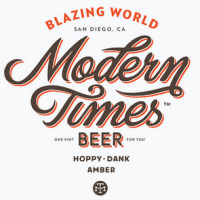 Modern Times is now 4/4 in my book. In a short amount of time they’ve become another go-to in the San Diego craft beer scene. The inclusion of the word “amber” on the front of the can prepared me for a different flavor experience than the one I received, but that doesn’t mean I didn’t thoroughly enjoy it. And here’s the dilemma, I wouldn’t consider this an Amber Ale. Even though the color was spot on, the hops were so dominant that the traditional malt flavors I normally expect from an Amber Ale were completely overshadowed. If you’re in the mood for a wonderful, easy-drinking West Coast IPA I would highly recommend picking up a can or four of Blazing World. But if you’re looking for a more “traditional” Amber Ale experience you might want to look elsewhere.